I was on the last leg of a six-day lecture tour in Japan, and utterly exhausted from having given variations of the same speech four times already through an interpreter, plus two TV interviews on the same theme: that genetic engineering agriculture does not feed the world and is a very dangerous diversion besides. I was sorely in need of inspiration as we made the journey from Tokyo to Fukuoka in Kyushu by the bullet-train the day before the last lecture was due. Tony Boys, my interpreter for the occasion, who teaches English language and does research on how to make Japan sustainable, told me about an organic farmer not far from Fukuoka, who has done wonders introducing ducks into the rice paddy field. I suggested we should visit him. Mr. Watanabe, the other speaker on our lecture tour, who has written many books including five recent ones on genetic engineering biotechnology, decided to come along. The train ride lasted five and a half hours, speeding through a most unusual landscape which repeats itself in endless variations for the entire duration. It consists of large and small clusters of houses and the occasional single abode, all floating, it seems, on a sea of paddy-fields. Paddy fields fill every available inch of land that is not built upon, and most of the plots are tiny. That was a real surprise for me, who, like most people, imagine Japan to be a fully industrialized developed nation. Apparently, small-scale rice farming is still the norm. But, according to Tony, the Japanese Government want to change that, to make farming more efficient. Tony also told me that Japan was once self-sufficient in soya beans, but now 98% is imported. Consumers are up in arms as soya is extensively used in Japanese cuisine and a lot of it comes from the United States, the world's biggest grower of transgenic soya. The Consumer Union of Japan have collected 2 million signatures demanding compulsory labelling earlier this year. A much more comprehensive set of demands signed by 240 000 was delivered simultaneously to the Minster of Agriculture and Minister of Health on the day that I arrived in Tokyo. The demands included, besides compulsory labelling, a moratorium on growing transgenic crops, suspension of research on transgenic rice and cattle-cloning, withdrawal of cloned beef from the market, and, significantly, support for organic farming. Our hosts from the Green Co-op in Fukuoka met us at the station, and after the usual polite exchange of bows, we were taken to another platform for the local train to Keisen, where the famous organic farmer Mr. Takao Furuno had kindly invited all three of us to stay the night with his family. The plan is to return to Fukuoka by lunch time the next day to give our lectures. It was getting dark by the time we arrived in Keisen. Tony telephoned from a booth outside the station, and some minutes later, Mr. Furuno himself came to pick us up in his mini-van. We drove a short distance and stopped in front of a largish but modestly built and modestly furnished bungalo. Mrs. Furuno opened the door and gave us a warm traditional Japanese welcome. We were invited to sit down around the dinner table where all the children came to greet us. Five healthy, suntanned and smiling children, two boys and three girls between the ages of 16 and 8, introduced themselves, then retreated next-door to the kitchen where they were served supper. Grandma and Grandpa were busy with food preparation, and appeared only later to say hello. The Furunos are a handsome couple in their forties. He is wiry and dark, with a winsome squint and sparkle to his eyes, which give him the appearance of being both amused and content with life, as he has every reason to be. He speaks in an even, unhurried manner, with a gentle tone. She is of medium build, lively, good looking and more openly ebullient about their success. Of course, they do not mean success in financial terms, they mean success of the farming method, which, since its introduction ten years ago, is now spreading all over Southeast Asia. In Japan, about 10 000 farmers have taken it up. The practice has been adopted by farmers in South Korea, Vietnam, The Phillipines, Laos, Cambodia, Thailand and Malaysia. Farmers have increased their yield 20 to 50 percent or more in the first year. One farmer in Laos increased his income three-fold. It is obviously a boon to Third World farmers. "We want to help", the Furunos declared, "financial success is unimportant. We did not patent the method, we just want it to be widely adopted." The method has been researched and perfected over the years in their own field. At this point, Mr. Furuno introduced one of the young men working with the family in order to learn the method. "There's always someone here who wants to learn, and everyday, I get several phone calls from people needing advice." He said as a matter of fact, without either false modesty or pride. The young man's eyes widened when he learned that I was the niece of the wife of Kyu Ei Kan. Kyu Ei Kan is a writer most renowned for his books on how to make money. And to demonstrate that what he writes is sound, he proceeded to make a lot of money himself. The excited young man pushed the book he was reading in front of me. It had my uncle's photograph on the cover, and the title, How I Became Rich -- An Autobiography. Mr. Furuno must really be a great success if a young man who dreams of becoming rich should be so eager to learn from him. I made a mental note to tell my aunt, and maybe persuade my rich uncle to go into organic farming business. "Well, it has been called a `one-bird revolution'", my host began, "the duck is the key to success." The secret is to release ducklings into the paddy fields soon after the seedlings are planted. But won't the ducklings eat the rice seedlings? No. "It is in their nature not to eat the rice seedlings." Mr. Furuno assured me, then added, "agronomists in the university say it's because rice seedlings have too much silica." They have made a very good video, complete with English narration, which shows how the ducklings readily take to the paddy field when they are led there to be released. About 20 ducklings are released per tenth of a hectare. They genuinely seem to enjoy getting into the water, where they paddled contentedly between the rows of rice seedlings, now ducking under the surface of the water, now raising their heads to swallow something, but never harming the rice seedlings. In fact, the ducks are good for the rice plants in many ways, including the mechanical stimulation they provide, which make the plant stems thicker and stronger, as demonstrated by careful experimentation. Mr. Furuno did attend agricultural college, but he did not learn the Aigamo method there. Aigamo is the name for the ducks, which is a crossbreed between domestic and wild ducks. He simply worked out the method by a combination of contemplation, inspiration and experimentation. Actually, ducks have been raised in paddy fields in China and probably other parts of South East Asia since a long time ago. But the farmers never left the ducks in the fields, and were unaware of all the benefits that the ducks can bring. 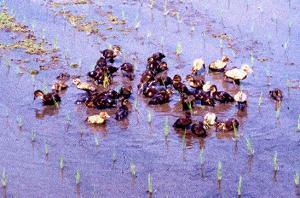 The benefits the ducks give to the rice plants are numerous; again, that was worked out by Mr. Furuno's scientific experiments carefully set up in the field. The ducks eat up insect pests and the golden snail which attack rice plants, they also eat the seeds and seedlings of weeds, using their feet to dig up the weed seedlings, thereby oxygenating the water and encouraging the roots of the rice plants to grow. You can actually see the difference between the plants in the Aigamo plots and the control plots without Aigamo. In fact, the ducks are so good at weeding that Third World farmers who have adopted the method now have time to sit and chat instead of spending up to 240 person-hours per hectare in manual weeding every year. Besides, `pests and weeds' have been miraculously transformed into resources for rearing ducks. The ducks are left in the fields 24 hours a day, and do not need to be herded back to the shed. They are protected from dogs by an electric fence or some other barrier around the field. There is a patch of dry land for the ducks to rest and also for them to be fed waste grain from the rice-polishing factory, so they maintain a relationship with the farmer. But otherwise, the ducks are completely free-ranging until the rice plants form ears of grain in the field. At that point, the ducks have to be rounded up (otherwise they will eat the rice grains). They are then confined in a shed and fed exclusively on waste grain. There, they mature, lay eggs, and get ready for the market. It was too early in the year to plant the rice seedlings in Furuno's own paddies. Japanese farmers time their planting according to the length of the growing season quite precisely. So, as we came South on the train, we noticed more and more dry vacant fields. Furuno's in-laws, who live some distance away, have already planted the seedlings and flooded the fields, and we were to be taken there to see the ducklings being released the next morning. His father-in-law was once a rich businessman, but had decided to give up business for organic farming. The in-laws, who look ten years younger than their age, live in a large house with a beautiful garden and a permaculture orchard where chickens roam freely to keep the ground free of weeds, and presumably, also provide chicken manuare to fertilise the trees. The ducks are not the only inhabitants of the paddy field. The aquatic fern, Azolla, or duckweed, which harbours a blue-green bacterium as symbiont, is also grown on the surface of the water. The azolla is very efficient in fixing nitrogen, attracting insects for the ducks and is also food for the ducks. The plant is very prolific, doubling itself every three days, so it can be harvested for cattle-feed as well. In addition, the plants spread out to cover the surface of the water, providing hiding places for another inhabitant, the roach, and protecting them from the ducks. In fact, the roach grows so well in the paddy that Mr. Furuno has not bothered to count them. What do the fish feed on? They feed on duck feces, on daphnia and other worms, which in turn feed on the plankton. The fish and ducks provide manuare to fertilise the rice plants all through the growing season. The rice plants in turn provides shelter for the ducks. The paddy field with ducks and all is really a complex, well-balanced, self-maintaining, self-propagating ecosystem. The only external input is the small amount of waste grain for the ducks, and the output? A delicious, nutritious harvest of organic rice, duck and roach. It is amazingly productive. The Furunos' farm is 2 hectares; 1.4 of which are paddy fields, while the rest is devoted to growing organic vegetables. The organic vegetables fields were full of butterflies of all kinds when we visited them the next morning. This small farm yields annually 7 tonnes of rice, 300 ducks, 4000 ducklings, and enough vegetables to supply 100 people. At that rate, no more than 2 percent of the population need to become farmers in order to feed a nation. Tony Boys indeed believes that with proper management, Japan can become self-sufficient once more. So who needs transgenic crops? The choice is clear, not only for Japan, but for all of South East Asia, and the world at large. This Aigamo method also explodes the myth that organic farming is necessarily labour intensive. "Organic farming need not be labour intensive, it is fun!" said Mr. Furuno emphatically. The Furunos are not purists, and they use both mechanical harvesters and tractors. Their method is so simple and enjoyable that five years ago, the two eldest boys managed their own small plot and got a bumper harvest from it. That was also documented on video. Mr. Furuno, however, will complain that they are very, very busy, and no wonder. They run their own vegetable business, process their own ducks and sell those as well. In addition, he writes books, papers, runs courses, and lectures all over S.E. Asia. Later that evening, we were treated to a delicious meal of home grown organic rice, duck, chicken and vegetables, complete with unlimited bottles of Furuno's own brand of organic sake and fragrant pine wine, both bearing the label, One Bird, Ten Thousand Treasures. Mr. Furuno's one ambition in life is to share these boundless treasures, this unlimited harvest, with the world. We bathed in the warm glow of this wonderful thought, and ate and drank deep into the night, becoming more convinced by the hour that the harvest is indeed limitless and free to all who work creatively in partnership with her.